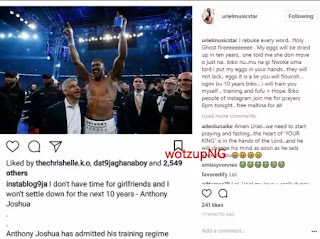 Abeg this love obsession from Ex Big Brother Nigeria housemate to Anthony Joshua, heavywieght boxing champion is becoming weirder everyday and this is not the first nor the second time former BBNaija housemate openly professed her love for Anthony Joshua. However, it seems her hope of hooking the World Heavyweight Boxing title holder is slowly getting dashed as the Champ announced that he doesn’t have time for girls and wont settle down for the next 10 years. After the news broke out, Uriel took to her Instagram page to make it clear that she can’t afford to wait that long to nab him cos she might have reached menopause by 10 years time. I don’t know if she is joking or being serious but a si kwam ma ka, maka okenyi anaghi ano na ulo ewu amoo na oba. Igbo na si, ka ejiri ehihe chuo ewu ojii tukwu chi ejie..